Purpose: To evaluate the efficacy and safety of neoadjuvant platinum-based chemotherapy during pregnancy in women with cervical cancer. 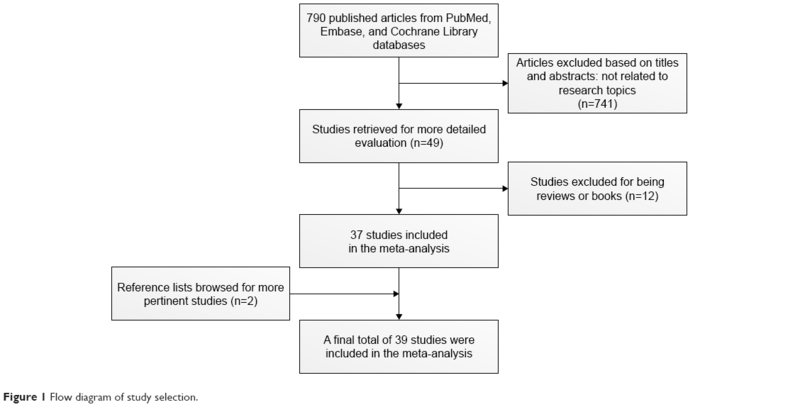 Methods: The PubMed, Embase, and Cochrane Library databases were fully searched to find eligible studies regarding platinum use during pregnancy in women with cervical cancer from January 1980 to September 2018. Data were extracted from the selected studies independently by two authors. Descriptive statistics were calculated for categorical data (frequency and percentage) and numeration data (mean and SD for normally distributed data and median and range for abnormally distributed data). 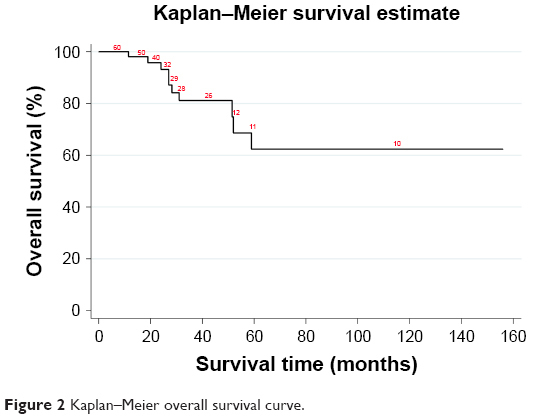 Survival analyses were performed using Kaplan–Meier survival curves and log-rank tests to estimate overall survival and progression-free survival for all patients. Results: A total of 39 studies including 88 cervical cancer patients with platinum administration during pregnancy were selected in this meta-analysis, and 64 women provided International Federation of Gynecology and Obstetrics stage information. Among the latter, 56 of 64 (87.5%) were diagnosed with early stages (I and IIA) and the remaining 8 of 64 (12.5%) had advanced stages (IIB, III, and IV). In relation to cisplatin, 86 pregnant women were identified, whereas only 2 pregnant women with carboplatin application were retrieved. Overall, 88 newborns were delivered from 84 pregnancies, including two sets of twins and one set of triplets, among which 71 neonates (71 of 88, 80.7%) were completely healthy at birth. All children were healthy at the end of follow-up (median 17 months, range 0–149.5 months), except one who was diagnosed with retroperitoneal embryonal rhabdomyosarcoma at 5 years old and one who had acute myeloid leukemia at 22 months of age. At the end of follow-up (range 4.75–156 months), 16 of 81 (19.8%) patients were diagnosed with recurrence of cervical cancer, and 11 (90%) of those died because of cancer relapse. Neither median overall survival nor median progression-free survival were reached. Conclusion: Our results demonstrated that neoadjuvant platinum-based chemotherapy could be a favorable choice for the management of patients with cervical cancer during the second and third trimesters. To reduce the side effects of chemotherapy, cisplatin might be good to use as monotherapy in these patients. Cervical cancer, one of the most common cancers in women, is rarely observed during gestation, with reported incidence varying between 0.02% and 0.9%.1 Owing to its low incidence, the diagnosis of cervical cancer in pregnancy is a very rare event for expectant mothers and medical doctors. Once diagnosed, it may represent a complex situation for both the patient and physician.2 Although a guideline was developed after a systematic searching and review of the current literature by the European Society of Gynecological Oncology in 2018,3 there are no data from large randomized trials that provide optimal therapeutic schedules for cervical cancer during pregnancy. In addition, the management of cervical cancer patients with pregnancy depends on several factors, such as tumor size, lymph-node involvement, duration of pregnancy, histological subtype, and the patient’s wish to maintain pregnancy.4–6 Therefore, multidisciplinary teams, including a gynecologic oncologist, obstetrician, pathologist, and neonatologist, are needed to give the best therapeutic strategy to the patients and create an individual treatment approach. 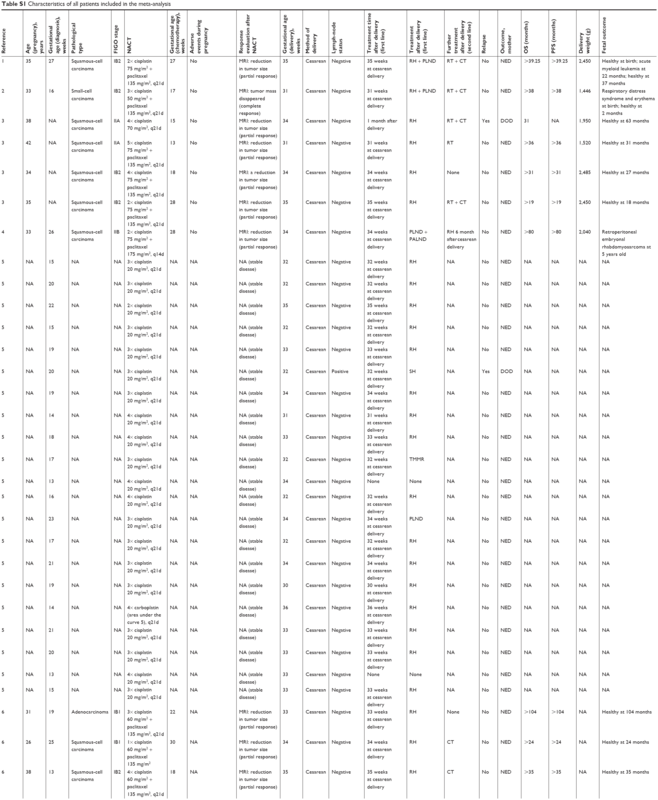 A comprehensive systematic computerized literature search on the PubMed, Embase, and Cochrane Library databases was conducted to identify relevant studies published from January 1980 to September 2018, using the following keywords and subject terms: ([cervical OR cervix] AND cancer OR cancers OR neoplasia OR neoplasias OR neoplasm OR neoplasms OR tumor OR tumors OR malignancy OR malignancies OR carcinoma OR carcinomas) AND (pregnancy OR pregnant OR gestation) AND (chemotherapy OR platinum OR cisplatin OR cis-diamminedichloroplatinum OR platinum diamminodichloride OR cis-platinum OR platino OR platinol OR platidiam OR biocisplatinum OR NSC-119875 OR carboplatin OR paraplatin OR carboplat OR paraplatine OR platinwas OR ribocarbo OR blastocarb OR nealorin OR cis-diammine platinum II OR carbotec OR ercar OR CBDCA OR JM-8 OR neocarbo OR NSC-241240 OR nedaplatin OR NSC-375101D OR 254 seconds OR cycloplatin OR oxaliplatin OR 1,2-diaminocyclohexane platinum oxalate OR eloxatine OR ACT-078 OR lobaplatin OR 1,2-diaminomethylcyclobutane-platinum lactate OR D-19466). Full texts of the retrieved articles were reviewed to inspect whether information on the topic of interest was included. Independent supplementary manual searches on the reference lists of all selected publications were done to obtain additional eligible studies not acquired initially. No language restriction was imposed. All candidate studies were carried out by two independent reviewers (SYZ and LY), and discrepancies were resolved by consensus. Inclusion criteria were pregnant women with cervical cancer; all published prospective and retrospective studies, as well as case reports, that provided relevant and sufficient information on patients, regardless of sample size; and platinum administration during pregnancy. If multiple publications reported the same or overlapping data, the latest study with the largest population was adopted. Studies were excluded if populations were not pregnant women with cervical cancer, if they were reviews, books, or comments, platinum was not administered during the pregnancy, and data provided were insufficient or irrelevant. To avoid extraction errors, original data were separately gathered in duplicate by two authors. From each recruited study, the following information was collected: first author, publication year, patient age at diagnosis, gestational age at diagnosis, pathological type of cervical cancer, International Federation of Gynecology and Obstetrics (FIGO) stage of cervical cancer, neoadjuvant platinum-based chemotherapy regimens during pregnancy, gestational age at first cycle of chemotherapy administration, adverse events during pregnancy, response to chemotherapy, gestational age at delivery, method of delivery, fetal outcome, weight at delivery, treatment after pregnancy, lymph-node status, condition of relapse, overall survival, progression-free survival, and outcomes for mothers. The meta-analysis was carried out using two sets of calculations. Missing data were not included in statistical analysis, and the number of cases with missing data was specified for every outcome assessed. First, standard descriptive statistics were calculated for categorical data (frequency and percentage) and numeration data (mean and SD for normally distributed data, median and range for abnormally distributed data). Second, survival analysis was performed to estimate overall survival and progression-free survival for all participants, employing Kaplan–Meier survival curves. In an attempt to obtain a visual comparison among various subgroups, log-rank tests were used to assess differences in overall survival and progression-free survival in patients treated with different platinum-based agents during pregnancy and diagnosed with diverse pathological types of cancer. All statistical analyses were conducted with Stata 12.0 (StataCorp LP, College Station, TX, USA), and a P<0.05 was defined as statistical significance. A flowchart showing the study-selection process is presented in Figure 1. Following the search strategy, our initial literature search yielded 790 published studies, of which 741 were excluded for not investigating the efficacy and safety of neoadjuvant platinum-based chemotherapy during pregnancy in patients with cervical cancer after screening titles and abstracts. After subsequent review of the remaining 49 articles, 12 were excluded due to the type of articles: 10 were reviews and the other 2 were books. In the end, 37 papers remained.2,17–52 In order to gather more publications, additional searches on the reference lists of these 37 papers were also performed. As a result, two more papers were identified.53,54 As such, a total of 39 studies were included in the present meta-analysis. Figure 1 Flow diagram of study selection. Detailed characteristics of all patients are presented in Table S1. In total, 88 patients diagnosed with cervical cancer during pregnancy treated with neoadjuvant platinum-based chemotherapy were included in this study. Age at diagnosis of cervical cancer was not available for 27 patients, and the mean age at diagnosis of the remaining 61 women was 32.5 (SD 4.6, range 24–42) years. The majority of patients (67 of 79) were diagnosed during the second trimester of pregnancy (84.8%), while 3 of 79 were diagnosed in the third trimester (3.8%). Nine of 79 were diagnosed in the first trimester (11.4%), but such data in 9 cases were missing. The mean gestational age at cervical cancer diagnosis was 18.9 (SD 4.6, range 8–29) weeks. Pathological type and FIGO stage of cervical cancer were provided for 61 and 64 patients, respectively. Diagnosis of squamous-cell carcinoma of the cervix was established in 73.8% of women (45 of 61), whereas adenocarcinoma was diagnosed in 14.8% (9 of 61). Among the remaining seven cases, two were diagnosed as clear-cell carcinoma and another two confirmed as small-cell carcinoma. Additionally, one patient with each of adenosquamous, glassy-cell, and oat-cell carcinoma was identified. FIGO stage was early (I and IIA) in 87.5% of women (56 of 64) and advanced (stages IIB, III, and IV) in 12.5% (8 of 64), respectively. All 88 patients with cervical cancer received neoadjuvant platinum-based chemotherapy without termination of pregnancy. Cisplatin was used either alone in 55 patients (62.5%) or in combination with other drugs in 31 patients (35.2%), such as paclitaxel (17 of 88), vincristine (9 of 88), doxorubicin (1 of 88), 5-fluorouracil (1 of 88), bleomycin (1 of 88), or vincristine and bleomycin (2 of 88). However, carboplatin was applied together with paclitaxel in one patient (1.1%), while another one (1.1%) was treated with carboplatin alone as monotherapy. A total of 85 patients were treated with neoadjuvant platinum-based chemotherapy during the second or third trimester, except for 3, for whom no information could be obtained, though detailed data of gestational age at chemotherapy start were only available for 36 women. Additionally, NACT was initiated in two women at gestational ages of 13 and 10 weeks. Chemotherapy was initially administered on average in the 22.4 (SD 5.3, range 10–33) weeks of gestation. Data on response to chemotherapy were reported for 69 patients. Response rates of women after NACT were 8.7% for complete responses (6 of 69), 46.4% for partial responses (32 of 69), 42.0% for stable disease (29 of 69), and 2.9% for progression of the disease (2 of 69), respectively. Dosage, number of chemotherapy cycles, and relevant MRI descriptions evaluating chemotherapy response are presented in Table S1. Generally, chemotherapy was well tolerated during pregnancy without any signs of toxicity in 38 of 51 women (74.5%) for whom relevant data were available. However, various types of adverse events or pregnancy complications were recorded in the remaining 13 women (25.5%). Grade 3 adverse events (thrombocytopenia, anemia, and allergic reaction to paclitaxel) happened in three women, while two had events of nausea and fatigue. One pregnancy each in the case group showed drug intolerance, thrombocytopenia, neutropenia, nausea, and vomiting, anemia, and emesis. Three cases were diagnosed with different pregnancy complications, including antepartum hemorrhage, placenta previa, preeclamptic syndrome, and oligohydramnios. At 8 days after administration of the first cycle of cisplatin, one woman was admitted to hospital with extremely preterm premature rupture of the membranes, which led to miscarriage. Moreover, cervical biopsy was repeated a week following the first cycle treatment of cisplatin in another woman, demonstrating no definitive change and no decrease in tumor size. Therefore, radical hysterectomy and pelvic lymph-node dissection were performed at 2 weeks after chemotherapy and no infant was born. Delivery methods and gestational ages of 82 women at childbirth were provided from included studies. Cesarean delivery was carried out in 81 women (81 of 82, 98.8%). Additionally, one woman28 had a vaginal birth, though cesarean surgery had been scheduled for the 38th week of gestation. Three days before, however, in week 37+4 days, the patient was admitted in labor with 7 cm dilatation of the cervix. Fetal monitoring and continuation of vaginal birth were chosen by the obstetrics team. Furthermore, 80 of 82 women had premature births (97.6%) while another 2 had term deliveries (2.4%), with a mean gestational age at delivery of 33.1 (SD 1.9, range 27–38) weeks. 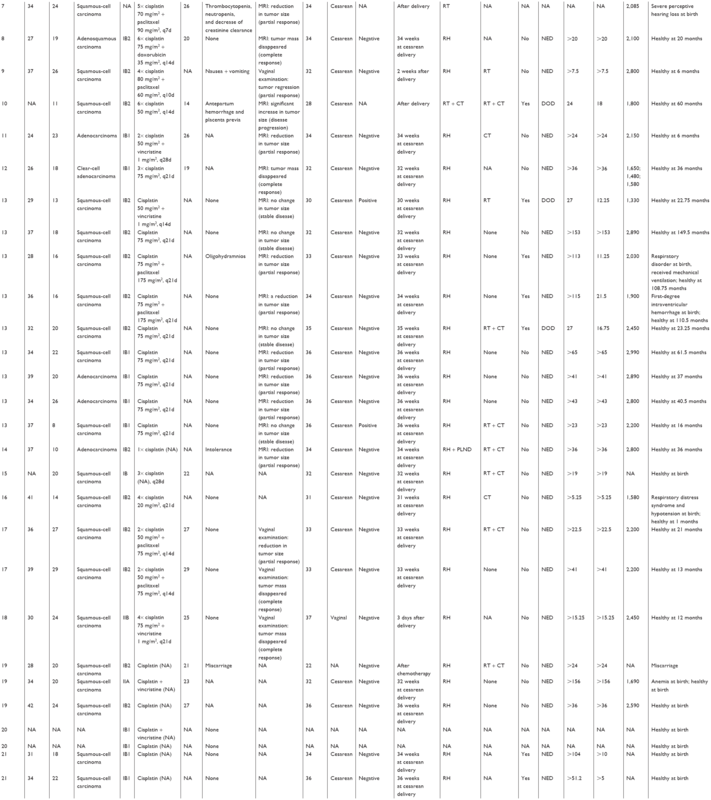 Data on treatment following delivery were obtained from 82 of 88 cases. Cesarean delivery was combined with radical hysterectomy in 65 of 82 patients (79.3%), simple hysterectomy in 1 patient (1.2%), total mesometrial resection in 1 patient (1.2%), pelvic–aortic lymphadenectomy in 2 patients (2.4%), and pelvic lymphadenectomy in 1 patient (1.2%). In addition, radical hysterectomy was separately conducted in two patients at 2 weeks (1.2%) and 1 month (1.2%) after cesarean delivery. Three women (3.7%) were treated only with chemoradiation therapy, and one woman (1.2%) had radiation therapy after delivery. It was worth mentioning that the woman (1.2%) who selected vaginal delivery received a radical hysterectomy at 3 days after delivery. Also, two women (2.4%) who had miscarried accepted radical hysterectomy following chemotherapy. However, no treatment was performed in two women (2.4%)2 at cesarean delivery. Moreover, one woman (1.2%)42 refused further treatment at the time of cesarean delivery and puerperium. Data relating to the further treatment after radical surgery or chemoradiotherapy following delivery were accessible for 55 patients. Fifteen women (27.3%) received further chemoradiotherapy, and six each treated only with chemotherapy (10.9%) and radiotherapy (10.9%) were identified. One woman (1.8%) underwent a cesarean delivery coupled with pelvic–aortic lymphadenectomy, as she refused hysterectomy and radiotherapy, and had a radical hysterectomy 6 months after delivery. One woman (1.8%) refused further treatment, and no additional therapy was used in 26 women (47.3%). Data regarding on lymph-node status and recurrence were available for 79 and 81 patients, respectively. At pathological evaluation of surgical specimens, eight women (10.1%) were diagnosed with lymph-node metastasis, while the final histopathology reports of 71 women (89.9%) showed no evidence of lymph-node malignancy. A total of 16 women (19.8%) relapsed, among which 11 died of tumor progression with a median follow-up of 27.6 (range 11.5–59.0) months. Conversely, 65 women (80.2%) did not manifest any evidence of disease recurrence. Worthy of note, no deaths were observed among these patients. Data on fetal outcomes at birth were provided from 84 pregnancies. Collectively, 88 newborns were delivered from 84 pregnancies, including two sets of twins and one set of triplets. In 68 of 84 women (81%), 71 completely healthy neonates were born (71 of 88). The following conditions were noted in the remaining 17 newborns: respiratory syndrome disorder (8 of 88), mild elevation in serum creatinine (1 of 88), anemia (1 of 88), first-degree intraventricular hemorrhage (1 of 88), severe bilateral perceptive hearing loss (1 of 88), respiratory syndrome disorder combined with hypotension (1 of 88), hypoglycemia (1 of 88), anemia (1 of 88), supraventricular tachycardia (1 of 88), and erythema (1 of 88). The mean weight of newborns at birth was 2,163.2 (SD 447.1, range 1,330–2,990) g and all newborns had normal Apgar scores, but no data were available for 35 infants. Within the end of follow-up (median 17 months, range 0–149.5 months), 1 of 66 neonates for whom relevant data were available was diagnosed with retroperitoneal embryonal rhabdomyosarcoma when she was 5 years old. Furthermore, 1 male baby (of 66) experienced acute myeloid leukemia (AML) at the age of 22 months. The main characteristics of all neonates are shown in Table S1 in detail. Survival analyses were assumed to evaluate overall survival and progression-free survival of patients after receiving NACT during pregnancy. Kaplan–Meier curves concerning overall survival and progression-free survival are depicted in Figures 2 and 3, respectively. On the basis of the data provided in individual articles, 50 mothers were alive at the end of follow-up (range 4.75–156 months) in 60 women for whom the relevant data were available. Therefore, median overall survival could not be assessed. 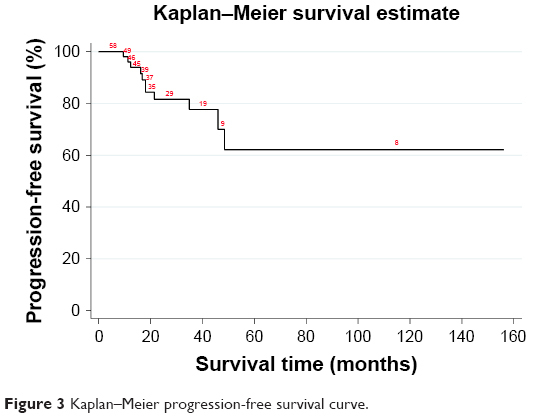 Similarly, median progression-free survival was not reached due to the fact that no tumor progression was observed at the end of follow-up (range 4.75–156 months) in 47 of 59 women from whom progression-free survival data were provided. Considering the fact that type of chemotherapeutic drug, different pathological and FIGO-stage diagnoses of cervical cancer might influence overall survival and progression-free survival, subgroup analyses were further conducted with log-rank tests according to these prespecified covariates. However, neither overall survival (log-rank χ12=0.88, P=0.349) nor progression-free survival (log-rank χ12=0.31, P=0.581) differed between women treated with cisplatin combined with other agents compared with women treated with cisplatin as monotherapy. Likewise, the log-rank test failed to yield any significant association between squamous-cell carcinoma and non-squamous-cell carcinoma of the cervix (overall survival, log-rank χ12=0.81, P=0.367; progression-free survival, log-rank χ12=1.73, P=0.189). Similarly, when stratified by FIGO stage (early for I and IIA, advanced for IIB–IV), no significant difference was observed (overall survival, log-rank χ12=2.08, P=0.150; progression-free survival, log-rank χ12=0.12, P=0.727). Figure 2 Kaplan–Meier overall survival curve. Figure 3 Kaplan–Meier progression-free survival curve. Multiple studies have revealed that application of an anticancer agent during gestation is not contraindicated, not only in cervical cancer but also in breast cancer, leukemia, lymphoma, and ovarian cancer.6,58–60 However, chemotherapy use during the first trimester may lead more easily to spontaneous abortion, fetal death, and fetal malformations, while NACT beyond the first trimester might be a safe option to allow for fetal maturation.61 According to this meta-analysis, neoadjuvant platinum-based chemotherapy was initially administered in all included cases on average after 22.4 weeks of pregnancy. One patient included in this meta-analysis who first received the administration of cisplatin during the second trimester (21 weeks) was admitted to the hospital with extremely preterm premature rupture of membranes at 8 days after the first cycle of chemotherapy, which led to miscarriage.29 Preoperative diagnosis for cervical cancer in pregnant women should follow the same approach as cases of nonpregnant patients, which is based on pathological examination. It should be noted that the extent of cancer development may exceed the controllable areas of surgery when NACT is inefficient during pregnancy. In this study, two cases were initially treated with chemotherapy at gestational ages of 1317 and 1046 weeks, and negative response to chemotherapy was obtained in one of the two women after a week following the first cycle treatment of cisplatin. Therefore, radical hysterectomy and pelvic lymph-node dissection were performed at 2 weeks after chemotherapy, resulting in no live birth for this patient.46 Therefore, it is increasingly essential to establish simpler and more precise methods to predict the effectiveness of chemotherapy in pregnant patients in future. Chemotherapy was well tolerated during pregnancy without any signs of toxicity in the majority of women (38 of 51). 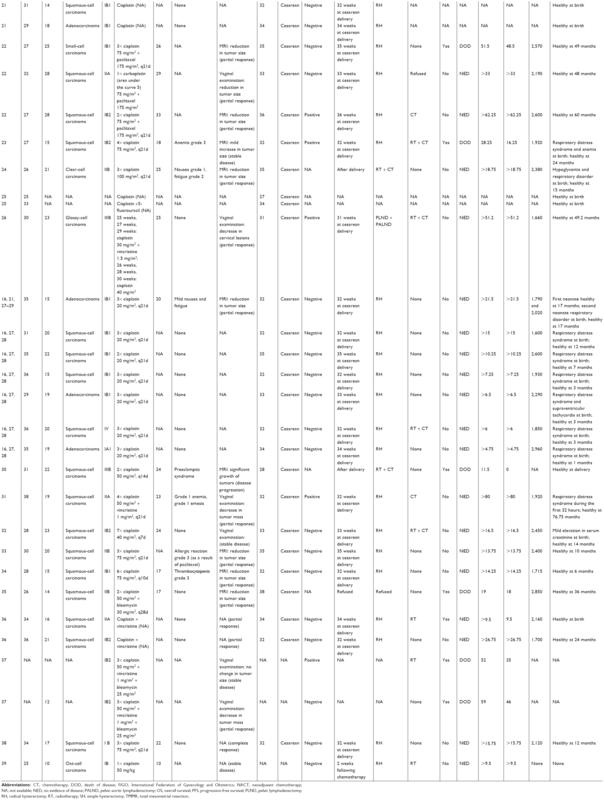 However, it is worth mentioning that some chemotherapy-associated adverse events were noted in 10 of 51 women, including drug intolerance, thrombocytopenia, anemia, allergic reaction, neutropenia, nausea, vomiting, and emesis. Three women suffered from various types of pregnancy complications: antepartum hemorrhage, placenta previa, preeclamptic syndrome, and oligohydramnios. It has been demonstrated that NACT in the second and third trimesters of pregnancy may be associated with intrauterine growth retardation, prematurity, and low birth weight in up to 50% of infants.62 In this study, the mean birth weight of 53 newborns approached 2,163.2 g. Additionally, all newborns had normal Apgar scores and were healthy within the follow-up (median 17 months, range 0–149.5 months). Notably, the TIP (paclitaxel, ifosfamide, cisplatin) regimen is currently considered the most effective NACT treatment. However, its application during pregnancy is not recommended, because ifosfamide potentially damages fetal kidneys.63 As such, the NACT regimen with paclitaxel plus cisplatin may be a proper option for patients with cervical cancer during pregnancy. However, there was one direct malformation described after chemotherapy with cisplatin plus paclitaxel during gestation, where the newborn was diagnosed with severe bilateral perceptive hearing loss at the age of 6 months.20 Similarly, one woman18 treated with cisplatin plus paclitaxel during pregnancy was reported to have given birth to a daughter who had retroperitoneal embryonal rhabdomyosarcoma at the age of 5 years. This is a rare cancer, has been postulated to be related to genetic factors, and belongs to secondary malignancies linked to chemotherapy in the infant. Furthermore, one infant experienced AML at the age of 22 months and received bone-marrow transplantation. The mother also received antitumor agents with cisplatin plus paclitaxel during pregnancy.50 Few chemotherapy-induced secondary tumors in newborns have been definitively identified, such as leukemia exposure to alkylating agents and bladder cancer exposure to cyclophosphamide.50 In addition, since no chromosomal translocation, such as chromosome 5/5q and/or 7/7q (frequently seen in secondary AML)64 or karyotypic deformities were detected in this baby, we are unable directly to ascribe the development of AML to maternal chemotherapy during pregnancy. Nevertheless, a female infant whose palms and soles were encased within a shiny, taut, cellophane-like membrane at birth was definitely confirmed with ichthyosiform erythema at 58 days after birth.51 Subsequent whole-exome sequencing of the newborn and her parents displayed a heterozygous de novo mutation (c148G>A, pD50N) in the GJB2 gene, which has been considered a genetic cause of congenital ichthyosiform erythema and keratitis–ichthyosis–deafness syndrome. However, the natural process of skin lesions in neonates has not been verified because the disease is rare, and as erythema and skin desquamation are especially evident in the erythematous type of agent-induced skin eruption, it cannot be denied that chemotherapy drugs might possess the capacity to exacerbate systemic skin lesions in the fetus. Consequently, long-term complications existing in the administration of NACT on fetuses in pregnant women with cervical cancer must be taken into account. A total of 16 patients were diagnosed with recurrence of cervical cancer (19.8%), and 11 (90%) died from relapse. However, the survival analysis of this work provided a different overall survival and progression-free survival results for patients compared to a previous meta-analysis performed by Zagouri et al.16 As shown in Figures 2 and 3, neither median overall survival nor median progression-free survival was allowed to be calculated on the basis of survival-related data extracted from patients. Actually, data on overall survival and progression-free survival were unavailable for 22 patients in 40 cases who had initially been included in this updated meta-analysis, which prevented us from obtaining an accurate condition of maternal survival. This observation points to the need for case reports that provide longer follow-up periods for the mother. Worthy of note, although Kohler et al2 did not provide survival-related information for any case, only one woman died of disease (nodal metastasis) and the overall survival rate was 95.3% after a mean follow-up of 33 months (range 7–88 months). In this meta-analysis, no tumor progression was observed during administration of neoadjuvant platinum-based chemotherapy, except in three women, generating a satisfactory tumor response in pregnant women included in this meta-analysis. Nevertheless, considering the fact that the choice of using single-agent cisplatin in the majority of women might have influenced tumor response and maternal survival, log-rank tests were further conducted, but failed to yield any significant difference in overall survival or progression-free survival between women treated with cisplatin combined with other agents and women treated with cisplatin as monotherapy. Therefore, to reduce the side effects of chemotherapy, cisplatin used in women with cervical cancer during pregnancy as monotherapy might be proposed. Moreover, in our systematic review, the prevalence of squamous-cell carcinoma in pregnant women was 73.8%, similar to the nonpregnant population. However, additional log-rank testing showed that neither overall survival nor progression-free survival differed in women diagnosed with different pathological types of cervical cancer after being administered NACT. Similar results were obtained from a log-rank test based on FIGO stage divided into early-stage (I and IIA) and advanced (IIB–IV) cervical carcinoma. The results of the present systematic review and meta-analysis should be interpreted within the context of several potential limitations. First, studies included in this meta-analysis were almost all case reports and case series, and these types of studies obviously provide low-quality evidence for meta-analysis. However, what cannot be ignored is that there are few available small-scale cohort studies and case reports reported for the treatment of pregnant women with cervical cancer, resulting in the rarity of randomized clinical trials concerning this medical problem. In other words, almost double the number of cases was included in our study compared to the previous systematic review, and thus the quality and reliability of our research has been improved to some extent. Second, although we tried to find suitable studies, we cannot be sure if some appropriate studies were overlooked and there may be other eligible studies that were not published and indexed by electronic databases yet. Third, it should be declared that the majority of individual studies did not provide survival-related data for each woman or other basic characteristics of patients (such as the pathological type of cancer or gestational age at diagnosis and delivery). Finally, the median follow-up of the babies was short and mid- and long-term outcomes for these infants are not known. As such, neither descriptive statistics nor survival analyses were able to be performed among the cases included in the study, reducing the reliability of this meta-analysis. In conclusion, despite the limitations, results of our study may favor on a maternal approach that administration of neoadjuvant platinum-based chemotherapy during the second and third trimesters in patients with cervical cancer. In order to reduce the adverse effects of chemotherapy, it is proposed that cisplatin might be administered as monotherapy during pregnancy in women with cervical cancer. However, because the influence of NACT on the newborn with congenital disease has not been completely elucidated, the decision to use chemotherapy in pregnant women with cervical cancer must balance the risk to the fetus vs prolonging maternal survival, and the effect of surgery delay on maternal survival should be carefully counseled. More studies with multicenter, randomized, controlled, double-blind protocols should be carried out to validate our findings and promote the formulation of more standardized treatment guidelines for these patients. This work was supported by grants from National Natural Science Foundation of China (81671809 and 81372381). The study sponsors had no involvement in the collection, analysis, or interpretation of data or in the writing of the manuscript. YS and XZ conceived and designed the study. YS and YL collected and analyzed the data. YS and ML prepared the manuscript. BS and XZ edited the manuscript. All authors contributed to data analysis, drafting and revising the article, gave final approval of the version to be published, and agree to be accountable for all aspects of the work. Pavlidis NA. Coexistence of pregnancy and malignancy. Oncologist. 2002;7(4):573–287. Köhler C, Oppelt P, Favero G, et al. How much platinum passes the placental barrier? Analysis of platinum applications in 21 patients with cervical cancer during pregnancy. Am J Obstet Gynecol. 2015;213(2):206.e1–5. Cibula D, Pötter R, Planchamp F, et al. The European Society of Gynaecological Oncology/European Society for Radiotherapy and Oncology/European Society of Pathology Guidelines for the Management of Patients with Cervical Cancer. Virchows Arch. 2018;472(6):919–936. Latimer J. Gynaecological malignancies in pregnancy. Curr Opin Obstet Gynecol. 2007;19(2):140–144. Lee JM, Lee KB, Kim YT, et al. Cervical cancer associated with pregnancy: results of a multicenter retrospective Korean study (KGOG-1006). Am J Obstet Gynecol. 2008;198(1):92.e1–6. Amant F, Halaska MJ, Fumagalli M, et al; ESGO task force ‘Cancer in Pregnancy’. Gynecologic cancers in pregnancy: guidelines of a second international consensus meeting. Int J Gynecol Cancer. 2014;24(3):394–403. de Vincenzo R, Amadio G, Ricci C, et al. Treatment of cervical cancer in Italy: strategies and their impact on the women. Vaccine. 2009;27(Suppl 1):A39–A45. Fanfani F, Fagotti A, Ferrandina G, et al. Neoadjuvant chemoradiation followed by radical hysterectomy in FIGO Stage IIIB cervical cancer: feasibility, complications, and clinical outcome. Int J Gynecol Cancer. 2009;19(6):1119–1124. Ferrandina G, Ercoli A, Fagotti A, et al. Completion surgery after concomitant chemoradiation in locally advanced cervical cancer: a comprehensive analysis of pattern of postoperative complications. Ann Surg Oncol. 2014;21(5):1692–1699. Pentheroudakis G, Pavlidis N. Cancer and pregnancy: poena magna, not anymore. Eur J Cancer. 2006;42(2):126–140. Benhaim Y, Haie-Meder C, Lhommé C, et al. Chemoradiation therapy in pregnant patients treated for advanced-stage cervical carcinoma during the first trimester of pregnancy: report of two cases. Int J Gynecol Cancer. 2007;17(1):270–274. Ostrom K, Ben-Arie A, Edwards C, Gregg A, Chiu JK, Kaplan AL. Uterine evacuation with misoprostol during radiotherapy for cervical cancer in pregnancy. Int J Gynecol Cancer. 2003;13(3):340–343. Morice P, Uzan C, Leary A. Are the outcomes of neoadjuvant chemotherapy for stage IB2 cervical cancer similar in pregnant and nonpregnant patient? Gynecol Oncol. 2012;127(1):257–258. Morice P, Uzan C, Gouy S, Verschraegen C, Haie-Meder C. Gynaecological cancers in pregnancy. Lancet. 2012;379(9815):558–569. Ilancheran A. Neoadjuvant chemotherapy in cervical cancer in pregnancy. Best Pract Res Clin Obstet Gynaecol. 2016;33:102–107. Zagouri F, Sergentanis TN, Chrysikos D, Bartsch R. Platinum derivatives during pregnancy in cervical cancer: a systematic review and meta-analysis. Obstet Gynecol. 2013;121(2 Pt 1):337–343. Ricci C, Scambia G, de Vincenzo R. Locally advanced cervical cancer in pregnancy: overcoming the challenge. A case series and review of the literature. Int J Gynecol Cancer. 2016;26(8):1490–1496. Surbone A, Achtari C. Embryonal rhabdomyosarcoma in a child exposed to chemotherapy in utero: a mere coincidence? Eur J Obstet Gynecol Reprod Biol. 2016;207:235. Kong TW, Lee EJ, Lee Y, Chang SJ, Son JH, Ryu HS. Neoadjuvant and postoperative chemotherapy with paclitaxel plus cisplatin for the treatment of FIGO stage IB cervical cancer in pregnancy. Obstet Gynecol Sci. 2014;57(6):539–543. Geijteman EC, Wensveen CW, Duvekot JJ, van Zuylen L. A child with severe hearing loss associated with maternal cisplatin treatment during pregnancy. Obstet Gynecol. 2014;124(2 Pt 2 Suppl 1):454–456. Yousefi Z, Hoshyar AH, Kadkhodayan S, Hasanzade M, Kalantari MR, Mottaghi M. Neoadjuvant chemotherapy and radical surgery in locally advanced cervical cancer during pregnancy: case report and review of literature. Oman Med J. 2013;28(1):60–62. Dawood R, Instone M, Kehoe S. Neo-adjuvant chemotherapy for cervical cancer in pregnancy: a case report and literature review. Eur J Obstet Gynecol Reprod Biol. 2013;171(2):205–208. Ayhan A, Dursun P, Karakaya BK, Ozen O, Tarhan C. Neoadjuvant chemotherapy followed by cesarean radical hysterectomy in a triplet pregnancy complicated by clear cell carcinoma of the cervix: a case presentation and literature review. Int J Gynecol Cancer. 2012;22(7):1198–1202. Fruscio R, Villa A, Chiari S, et al. Delivery delay with neoadjuvant chemotherapy for cervical cancer patients during pregnancy: a series of nine cases and literature review. Gynecol Oncol. 2012;126(2):192–197. Chvatal R, Oppelt P, Koehler C, Habelsberger A, Yaman C. Simple trachelectomy of early invasive cervix carcinoma in the second trimester. J Turk Ger Gynecol Assoc. 2011;12(2):121–123. Lanowska M, Köhler C, Oppelt P, et al. Addressing concerns about cisplatin application during pregnancy. J Perinat Med. 2011;39(3):279–285. Li J, Wang LJ, Zhang BZ, Peng YP, Lin ZQ. Neoadjuvant chemotherapy with paclitaxel plus platinum for invasive cervical cancer in pregnancy: two case report and literature review. Arch Gynecol Obstet. 2011;284(3):779–783. da Fonseca AJ, Dalla-Benetta AC, Ferreira LP, Martins CR, Lins CD. Neoadjuvant chemotherapy followed by radical surgery in pregnant patient with invasive cervical cancer: case report and literature review. Rev Bras Ginecol Obstet. 2011;33(1):43–48. Gambino A, Gorio A, Carrara L, et al. Cancer in pregnancy: maternal and fetal implications on decision-making. Eur J Gynaecol Oncol. 2011;32(1):40–45. Chun KC, Kim DY, Kim JH, Kim YM, Kim YT, Nam JH. Neoadjuvant chemotherapy with paclitaxel plus platinum followed by radical surgery in early cervical cancer during pregnancy: three case reports. Jpn J Clin Oncol. 2010;40(7):694–698. Rabaiotti E, Sigismondi C, Montoli S, Mangili G, Candiani M, Viganò R. Management of locally advanced cervical cancer in pregnancy: a case report. Tumori. 2010;96(4):623–626. Boyd A, Cowie V, Gourley C. The use of cisplatin to treat advanced-stage cervical cancer during pregnancy allows fetal development and prevents cancer progression: report of a case and review of the literature. Int J Gynecol Cancer. 2009;19(2):273–276. Seamon LG, Downey GO, Harrison CR, Doss B, Carlson JW. Neoadjuvant chemotherapy followed by post-partum chemoradiotherapy and chemoconsolidation for stage IIIB glassy cell cervical carcinoma during pregnancy. Gynecol Oncol. 2009;114(3):540–541. Favero G, Lanowska M, Schneider A, Marnitz S, Köhler C. Laparoscopic pelvic lymphadenectomy in a patient with cervical cancer stage Ib1 complicated by a twin pregnancy. J Minim Invasive Gynecol. 2010;17(1):118–120. Marnitz S, Köhler C, Oppelt P, et al. Cisplatin application in pregnancy: first in vivo analysis of 7 patients. Oncology. 2010;79(1–2):72–77. Marnitz S, Schmittel A, Bolbrinker J, et al. The therapeutic management of a twin pregnancy complicated by the presence of cervical cancer, following laparoscopic staging and chemotherapy, with an emphasis on cisplatin concentrations in the fetomaternal compartments amnion fluid, umbilical cord, and maternal serum. Fertil Steril. 2009;92(5):1748.e1–4. Benhaim Y, Pautier P, Bensaid C, Lhommé C, Haie-Meder C, Morice P. Neoadjuvant chemotherapy for advanced stage cervical cancer in a pregnant patient: report of one case with rapid tumor progression. Eur J Obstet Gynecol Reprod Biol. 2008;136(2):267–268. Bader AA, Petru E, Winter R. Long-term follow-up after neoadjuvant chemotherapy for high-risk cervical cancer during pregnancy. Gynecol Oncol. 2007;105(1):269–272. Karam A, Feldman N, Holschneider CH. Neoadjuvant cisplatin and radical cesarean hysterectomy for cervical cancer in pregnancy. Nat Clin Pract Oncol. 2007;4(6):375–380. Palaia I, Pernice M, Graziano M, Bellati F, Panici PB. Neoadjuvant chemotherapy plus radical surgery in locally advanced cervical cancer during pregnancy: a case report. Am J Obstet Gynecol. 2007;197(4):e5–e6. Caluwaerts S, van Calsteren K, Mertens L, et al. Neoadjuvant chemotherapy followed by radical hysterectomy for invasive cervical cancer diagnosed during pregnancy: report of a case and review of the literature. Int J Gynecol Cancer. 2006;16(2):905–908. Marana HR, de Andrade JM, da Silva Mathes AC, Duarte G, da Cunha SP, Bighetti S. Chemotherapy in the treatment of locally advanced cervical cancer and pregnancy. Gynecol Oncol. 2001;80(2):272–274. Tewari K, Cappuccini F, Gambino A, Kohler MF, Pecorelli S, Disaia PJ. Neoadjuvant chemotherapy in the treatment of locally advanced cervical carcinoma in pregnancy: a report of two cases and review of issues specific to the management of cervical carcinoma in pregnancy including planned delay of therapy. Cancer. 1998;82(8):1529–1534. Lai CH, Hsueh S, Chang TC, et al. Prognostic factors in patients with bulky stage IB or IIA cervical carcinoma undergoing neoadjuvant chemotherapy and radical hysterectomy. Gynecol Oncol. 1997;64(3):456–462. Giacalone PL, Laffargue F, Benos P, Rousseau O, Hedon B. Cis-platinum neoadjuvant chemotherapy in a pregnant woman with invasive carcinoma of the uterine cervix. Br J Obstet Gynaecol. 1996;103(9):932–934. Jacobs AJ, Marchevsky A, Gordon RE, Deppe G, Cohen CJ. Oat cell carcinoma of the uterine cervix in a pregnant woman treated with cis-diamminedichloroplatinum. Gynecol Oncol. 1980;9(3):405–410. Peculis LD, Ius Y, Campion M, Friedlander M, Hacker N. Stage IB2 adenosquamous cervical cancer diagnosed at 19-weeks’ gestation. Aust N Z J Obstet Gynaecol. 2015;55(1):94–97. de Lima CA, Barcelos AC, Paschoini MC, et al. Conservative treatment of uterine cervical adenocarcinoma in pregnancy. Case Rep Obstet Gynecol. 2013;2013:692017. Abellar RG, Pepperell JR, Greco D, et al. Effects of chemotherapy during pregnancy on the placenta. Pediatr Dev Pathol. 2009;12(1):35–41. De Vincenzo R, Tortorella L, Ricci C, et al. Locally advanced cervical cancer complicating pregnancy: a case of competing risks from the Catholic University of the Sacred Heart in Rome. Gynecol Oncol. 2018;150(3):398–405. Kayahashi K, Mizumoto Y, Myojo S, Mitani Y, Tajima A, Fujiwara H. A successful case of neoadjuvant chemotherapy and radical hysterectomy during pregnancy for advanced uterine cervical cancer accompanied by neonatal erythroderma. J Obstet Gynaecol Res. 2018;44(10):2003–2007. Islam S, Mukhopadhyay L, Howells R. Neo-adjuvant chemotherapy and radical surgery for stage 1B cervical cancer in pregnancy. J Obstet Gynaecol. 2012;32(2):191–192. Cardonick E, Usmani A, Ghaffar S. Perinatal outcomes of a pregnancy complicated by cancer, including neonatal follow-up after in utero exposure to chemotherapy: results of an international registry. Am J Clin Oncol. 2010;33(3):221–228. Favero G, Chiantera V, Oleszczuk A, et al. Invasive cervical cancer during pregnancy: laparoscopic nodal evaluation before oncologic treatment delay. Gynecol Oncol. 2010;118(2):123–127. Pereg D, Koren G, Lishner M. Cancer in pregnancy: Gaps, challenges and solutions. Cancer Treat Rev. 2008;34(4):302–312. Yu HH, Cheung PS, Leung RC, Leung TN, Kwan WH. Current management of pregnancy-associated breast cancer. Hong Kong Med J. 2017;23(4):387–394. Ngu SF, Ngan HY. Chemotherapy in pregnancy. Best Pract Res Clin Obstet Gynaecol. 2016;33:86–101. Cardonick E, Iacobucci A. Use of chemotherapy during human pregnancy. Lancet Oncol. 2004;5(5):283–291. Loibl S, Han SN, von Minckwitz G, et al. Treatment of breast cancer during pregnancy: an observational study. Lancet Oncol. 2012;13(9):887–896. Horowitz NA, Henig I, Henig O, Benyamini N, Vidal L, Avivi I. Acute myeloid leukemia during pregnancy: a systematic review and meta-analysis. Leuk Lymphoma. 2018;59(3):610–616. Peccatori FA, Azim HA, Orecchia R, et al; ESMO Guidelines Working Group. Cancer, pregnancy and fertility: ESMO Clinical Practice Guidelines for diagnosis, treatment and follow-up. Ann Oncol. 2013;24(suppl 6):vi160–vi170. Brewer M, Kueck A, Runowicz CD. Chemotherapy in pregnancy. Clin Obstet Gynecol. 2011;54(4):602–618. Mir O, Berrada N, Domont J, et al. Doxorubicin and ifosfamide for high-grade sarcoma during pregnancy. Cancer Chemother Pharmacol. 2012;69(2):357–367. Masetti R, Vendemini F, Zama D, Biagi C, Pession A, Locatelli F. Acute myeloid leukemia in infants: biology and treatment. Front Pediatr. 2015;3:37. Abbreviations: CT, chemotherapy; DOD, death of disease; FIGO, International Federation of Gynecology and Obstetrics; NACT, neoadjuvant chemotherapy; NA, not available; NED, no evidence of disease; PALND, pelvic-aortic lymphadenectomy; OS, overall survival; PFS, progression-free survival; PLND, pelvic lymphadenectomy; RH, radical hysterectomy; RT, radiotherapy; SH, simple hysterectomy; TMMR, total mesometrial resection. da Fonseca AJ, Dalla-Benetta AC, Ferreira LP, Martins CR, Lins CD. [Neoadjuvant chemotherapy followed by radical surgery in pregnant patient with invasive cervical cancer: case report and literature review]. Rev Bras Ginecol Obstet. 2011;33(1):43–48. Giacalone PL, Laffargue F, Ben os P, Rousseau O, Hedon B. Cis-platinum neoadjuvant chemotherapy in a pregnant woman with invasive carcinoma of the uterine cervix. Br JObstet Gynaecol. 1996;103(9):932–934.